In a year when support for the Democrats has eroded among all registered voters, Latino registered voters continue to strongly support Democratic candidates. However, while Democrats have an advantage among Latino registered voters, overall Latinos voters are less motivated about this year’s elections than are all registered voters. Among all demographic groups of Latino registered voters, majorities say they will vote for the Democratic candidate in their local congressional election. Only among Latino registered voters who identify with or lean toward the Republican Party does a majority say they will vote for the Republican candidate in their local congressional race. Even so, in some demographic groups of Latinos, support for Republican candidates is higher than among all Latino registered voters. Three-in-ten (31%) Latino registered voters who say they have given the election quite a lot of thought say they will vote for the Republican candidate in their congressional district. Among those who are English dominant, three-in-ten (30%) say the same. And among those who are dissatisfied with the direction of the country, nearly three-in-ten say they will vote for the Republican candidate in their local congressional election (28%). Latino registered voters rank education, jobs and health care as their three top issues in this year’s congressional campaign. Nearly six-in-ten (58%) say education is extremely important to them personally, and more than half say jobs (54%) and health care (51%) are extremely important. 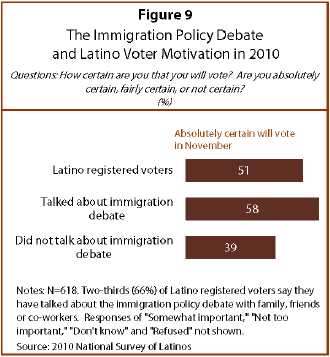 Among the issues asked about in the survey, immigration ranks as the fifth most important for Latino registered voters. Some 31% say it is an extremely important to them personally. The pattern is similar among all Latinos surveyed. Just as with Latino registered voters, education, jobs and health care rank as the top three issues for all Latinos. Overall, immigration ranks fourth for all Latinos. These results are in line with findings from other Pew Hispanic Center surveys in recent years. 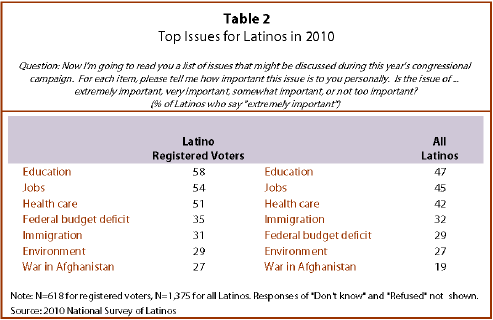 Consistently, Latinos say that pocketbook and family issues are the most important to them—and that immigration, while an important issue for many Latinos, is not at the very top of their list (Lopez and Livingston, 2009).5 Among all registered voters, immigration ranks even lower— 10th on a list of 13 issues (Pew Research Center for the People & the Press, 2010a). 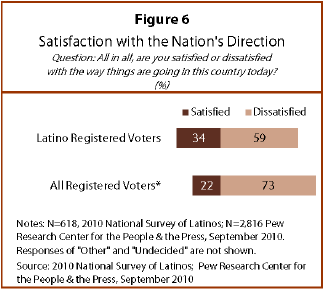 A majority of Latino registered voters (59%) are dissatisfied with the country’s direction. An even larger share (73%) of all registered voters say the same this year. (Pew Research Center for the People & the Press, 2010b). Also, the level of dissatisfaction among Latino registered voters now is down from a high of 70% in mid-2008 (Lopez and Minushkin, 2008a). In this year’s election cycle, Latino registered voters are less likely than all registered voters to say they are absolutely certain they will vote. Half (51%) of all Latino registered voters say this, while seven-in-ten (70%) of all registered voters say the same (Pew Research Center for the People & the Press, 2010a). Among Latino registered voters, those who are ages 50 to 64 (62%), have some college education (61%), are English dominant (58%) or are ages 65 or older (58%) are most likely to say they are absolutely certain they will vote in this year’s congressional elections. Meanwhile, those who are Spanish dominant (38%), have a high school education (42%) or less (43%), or are ages 18 to 29 (45%) are the least likely to say they are absolutely certain they will vote this year. When it comes to thinking about this year’s election, just as with voting, Latino registered voters are less engaged than are all U.S. registered voters. 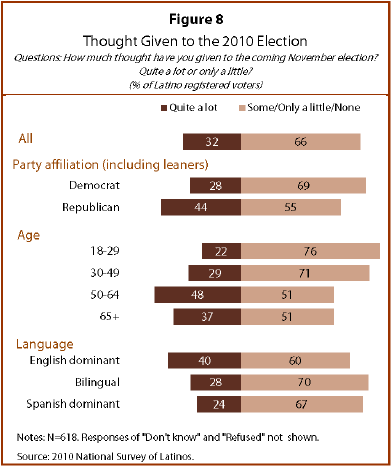 Just one-third (32%) of all Latino registered voters say they have given this year’s election quite a lot of thought. In contrast, half (50%) of all registered voters say the same (Pew Research Center for the People & the Press, 2010). 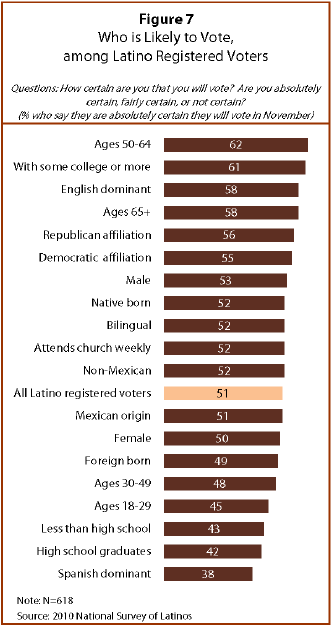 Among Latino registered voters, however, some groups have given the election more thought than others. Those who identify with or lean toward the Republican Party are more likely than those who identify with or lean toward the Democratic Party to say they have given the election quite a lot of thought—44% versus 28%. Among English-dominant Latino registered voters, some 40% say they have given the election quite a lot of thought, while three-in-ten (28%) of bilingual Latino registered voters and 24% of Spanish-dominant Latino registered voters say the same. Since the passage of Arizona’s SB 1070 in April of this year, the immigration policy debate has been reignited nationwide. The new survey shows that Latino registered voters who say they have talked about the immigration policy debate with family, friends or co-workers this past year are more motivated this election cycle than those who have not talked about the debate. Two-thirds (66%) of Latino registered voters say they talked about the immigration policy debate in the past year with someone they know. Nearly 6-in-10 (58%) of those who have discussed the immigration debate say they are absolutely certain they will vote in November, while four-in-ten (39%) of those who have not talked about the immigration debate say the same.